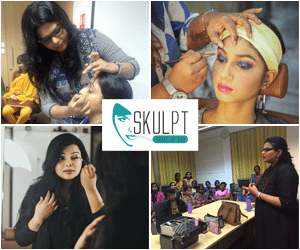 Skulpt has cemented its stature as one of the most reputed and recognised makeup academy, bringing to the forefront the best makeup techniques using unique educational concepts. For those who want to have an updated knowledge in contemporary styles, the advanced makeup artist course could open new opportunities. Students having an interest in developing their creative potential and learning new fashion techniques can find this course useful. In the beauty industry, you are never done with learning. There are always new techniques and strategies introduced now and then, to keep up with competition, it is important to embrace the latest. The advanced makeup course is for professionals who have a fundamental knowledge of makeup and want to proceed to the next level. Our courses take the professional content to a different status. The students at our academy are exposed to accurate makeup styles, combining colours and matching materials with skin features. Want to learn something new, Skulpt is the place to be. The small class size and individual attention give a professional understanding of the subject. Our trainers are here to support in your endeavour. Our teaching style is unique and has received the highest level of appreciation from various course participants. Our trainers are here to support in your endeavour. Our teaching style is unique and has received the highest level of appreciation from various course participants. Our tutors are the best in the industry and have exposure across the globe. Our trainer not just trains you but share their wealth of experience and industry knowledge. We give the most modern training tools to give our students an edge to turn into the best makeup artists ever. Our students have the advantage of having a headstart in their career as a portfolio for every student to enter the industry instantly. Through our organised photoshoot we give our students the opportunity to create an attractive and functional gallery of stunning shots. We pick professional models to pose for your gallery collection giving your portfolio a proficient touch. Go live with unlimited post training support and work placements. We can transform a basic makeup artist into a specialist with our advanced course curriculum. Get industry ready equipped with the latest techniques that are creating vibes in the industry. Be part of the makeup revolution by enhancing your skills further to give your career a boost. We take pride in delivering quality education and our ambassadors are spreading the word for us. Over a period Skulpt has become a brand by itself, and we want to extend our skills to those who want to shine in the world of makeup and styling. Our students land in plump jobs the moment they are out of their courses. Our course offers real-time exposure to students like backstage work, runway shows, magazine shoots, global events, hands-on experience during client makeup and more. We never hesitate to share our knowledge with our students, and this has made our students stand high on the pedestal of success.